HPL is changing to serve you better. Beginning in September 2018, there will be changes to some of our operating hours. Beginning September 9, 2018, our Waterdown Branch will be open on Sunday from 1:00 pm to 5:00 pm. Waterdown will be joining our other Sunday branches: Central Library, Dundas, Red Hill, Terryberry and Turner Park. Sunday Hours at these branches begin the Sunday after Labour Day and ends the Sunday before Canada Day. This year, HPL Branches will be open for elementary school shared PA days. Most branches will be open for these PA days except for Carlisle, Greensville and Mount Hope. Do you need a quiet space to study or work without the usual distractions? Beginning September 10, 2018, our Red Hill Branch will be offering extended Study Hours from Monday to Thursday from 9 pm to 12 midnight. 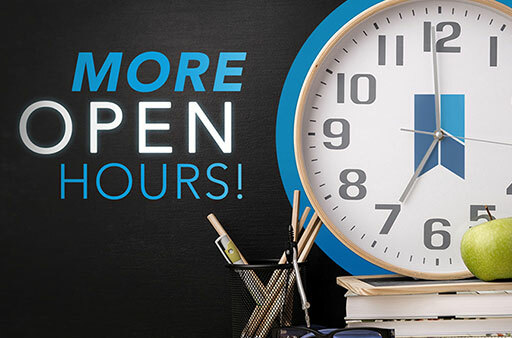 Read more about Extended Access Study Hours and how it works.